I want to thank you for not only thinking of us, but also for the memorable event. I cannot tell you the last time we had a ballet performed here at the AbbeWood. [We once] posted on the activity calendar for the residents to come see the Nutcracker. No one signed up. They wanted to go but were more worried leaving the community for one reason or another. We have over 120 residents currently residing at the AbbeWood and we had more than half of them attend the performance [you gave]. We have never had that many attend a single event that we have had here. I walked around and saw the professionalism and dedication of the performers, the beauty in their moves , and the sparkle in the residents’ eyes. I didn’t see a single resident move the whole time viewing the performance. They were at awe, and so were we. Calm with beauty was the undertone of the room allowing the residents to escape any thoughts of pain. Simply engaging. Upon departure of the performance, the residents said it was the best performance they have ever seen. 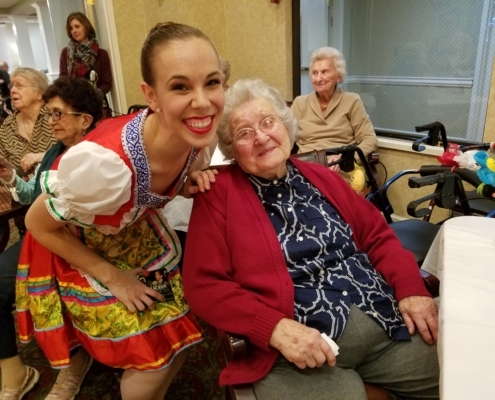 Thank you for bringing the talent of the ballet to the AbbeWood Senior Living Community. On Thursday night, Caroline found her nirvana as she took center stage surrounded by a company of seasoned ballerinas. An energetic, gleeful scream escaped her mouth and her arms excitedly flapped. The twinkling stars in the background caught her interest but she didn’t run toward them because she knew she was part of an important performance. I held my breath as Caroline gracefully glided to the tree stump where she was supposed to sit. As soon as she was in position her arms exposed how truly excited she was to be on stage. She flapped with glee and passion as she verbally stimmed. While Caroline was anxiously waiting to be called to the stage, she kept using her device to tell us “want to go dance,” “want to go to dance class,” “want to dance more” and then she would point to the stage and sign “dance, dance, dance.” Her excitement was contagious. When it was her time to be called to the stage, the sounds of her elatement could be heard throughout the auditorium. The North Pointe Ballet Company invited Caroline to play a small part during their dress rehearsal/sensory friendly-performance. The opportunity to see Caroline on stage surrounded by such hardworking and talented ballerinas brought a joy to my heart that cannot be explained. Not only did everyone in the company make Caroline feel welcomed they went above and beyond to make her feel special. During the curtain call, Caroline came out with Cinderella. And instead of giving Cinderella flowers, Prince Charming handed flowers to Caroline. She was completely overcome with joy. This was such a special night for our family. Vivian was also in the performance and did a wonderful job. When I found out that Caroline was going to be a girl – I imagined my daughters participating in activities together. But given Caroline’s autism that does not happen as often as I would like. So the opportunity to see both of my lovely ladies performing in the same show meant so much to me. I also got a high off of Caroline’s excitement and enthusiasm she was so excited to be part of the show she could hardly contain herself. Once her part of the performance was over, she brought back to sit with us in the audience because backstage was too overwhelming. On more than once occasion she made a break for it and headed directly for the stage because she wanted to continue dancing. I am thankful for opportunities for Caroline to participate in activities alongside her typical peers. There are times that it is appropriate for her to participate in activities that are designed for kids with special needs but sometimes it is nice when activities designed for typically developing kids are adapted to meet her needs. I feel it is just as valuable an experience for the typical kids in the ballet to experience Caroline as it is for Caroline to have the experience of being in the ballet. I heard from many parents that their daughter was excited to meet and work with Caroline. And that means a lot to me because I am trying to raise Caroline to be as independent as possible but sometimes her independence will require her to receive assistance from people who aren’t me, her father, or a teacher/therapist she works with on a daily basis. The fact that Caroline took direction and assistance from total strangers is a testament to not only the kindness and patience shown to Caroline by those working with her but Caroline’s growth over the last year. Needless to say, North Pointe Ballet’s 2017 performance of Cinderella will forever hold a dear spot in my heart because it gave my ladies a chance to perform together, Caroline an opportunity to be a star and the ballet company demonstrated the kindness and compassion that I hope Caroline continues to encounter throughout her life.